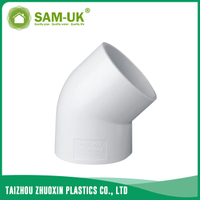 how to use PVC 45 degree elbow - Taizhou Zhuoxin Plastics Co., Ltd. 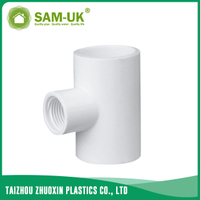 Whether it is necessary to bend the PVC pipe? PVC 45 degree elbow for water supply is part of the schedule 40 PVC pipe fittings series, and this pipe fitting is used in multiple fields. Next we explain the application of garden lawn irrigation. Application environment: two pipes connected with 90 degree. Prepare material and tools: PVC water pipe, 3/4 inch x 1/2 inch reducing female tee, 3/4 PVC elbow, plastic sprinkler head, pipe cutter, PVC glue, tape measure, pen. Step 1: before cutting pipe, in order to better connection, first clean up the sediment on the pipe. And then about 20cm away from the sprinkler head, the use of pipe cutter to cut the pipe, the another end of the distance about 10cm cut off. Step 3: At the another end of the pipe, connect with 3/4 inch PVC elbow by 45 DEG (S x S), and take a 10cm pipe connect with reducing female tee, the end of the pipe to connect with 45 degree elbow , and another elbow Into a straight line. Step 4: Use tape measure to measure the distance between the two elbows, taking into account the pipe and elbow contact part. According to the length of the measurement, use a 3/4 schedule 40 pipe, connect with the two elbows. 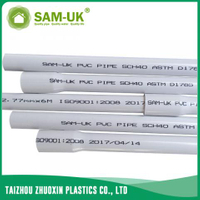 PVC glue because of the need for a period of time, so in order to ensure the sealing system, need to hold down about 1 minute. Step 5: Finally, connect the flexible pipe and sprinkler head.